Statistician-to-the-Stars William Briggs deserves credit for his correct prediction of the Best Picture Oscar the day before the ceremonies. And while Mr. Briggs would never encourage anyone to misuse his model this way, I feel my statistics heartstrings strummed by the desire to remind everyone about a particular common and dangerous statistical mistake: Correlation does not = causation. Mr. Briggs correctly predicted Argo would be selected as Best Picture from among the nominated films and noted that "The key reasons for its victory will be: the lead actor is at least forty, the other featured actors are mainly older men, and the picture took in only 20% of the money earned by 2012′s top film." I imagine Mr. Briggs tongue was planted firmly in his cheek, but if you read the words as they're written, they imply that if you want to win the Oscar for Best Picture, you should make a film that has these three qualities. After all, it's been noted that the people who vote are usually older men. With this in mind, we can take a look at a few movies that were clearly undeservedly spurned by the Academy this year. I chose examples from movies released after June 15th, 2012 that looked like they would have older male actors. Male actors and whether the movie had mostly male actors was determined from the cast lists on wildaboutmovies.com. Ages came from Bing searches in the format of the actor's name followed by the word "age". The amount of money a movie grossed in the US market is from boxofficemojo.com. 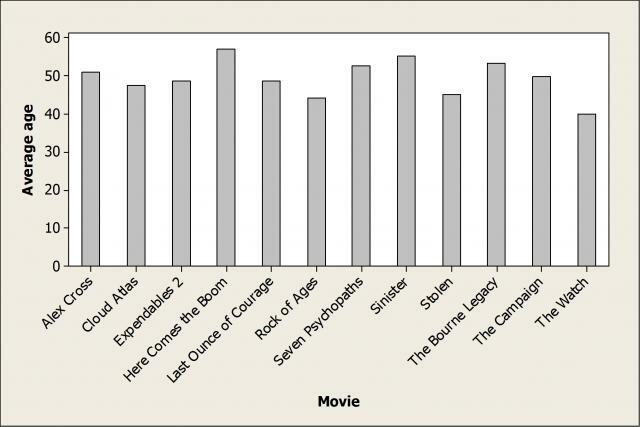 Of course, to make it clear which movies worked the hardest, it's always best to use an image rather than a table. Minitab Statistical Software's bar charts are great for making the data even clearer. 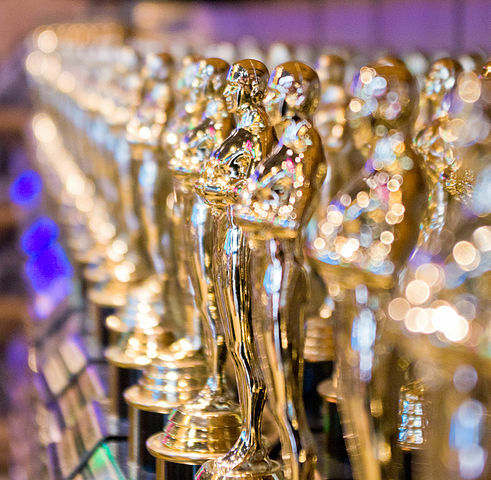 But if we really want to see who wanted the Oscar the most, we'd sort the bars to show the highest average age in the first position we typically examine: the left. Alas, the academy didn't appreciate Here Comes the Boom's story of the biology teacher who really fights for his kids. 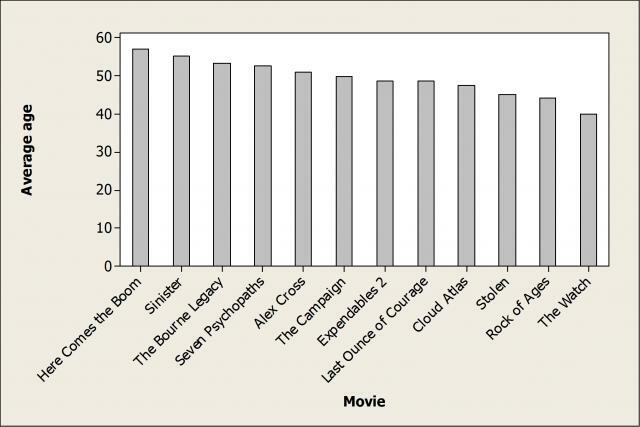 To put the movie that made the least money on the left, we sort the bars in ascending order instead of descending order. When you think about it, isn't Stolen's story of an ex-con rescuing his estranged daughter really the same thing as Argo's story of people pretending to make a movie rescuing hostages from Iran? Of course, if he was aware of Mr. Briggs' model, then the really disappointed person is going to be Martin McDonagh, the writer and director of Seven Psychopaths. After all, his was the only movie bold enough to both cast mostly older men and not make much money. 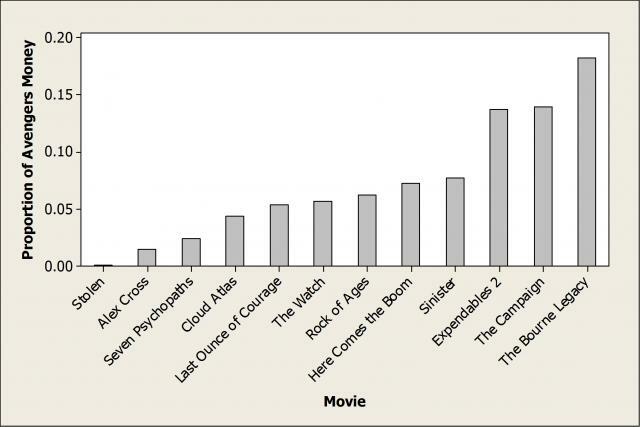 But since Mr. McDonagh probably knows that correlation doesn't = causation, he'll probably leave his characters to their original violent ends instead of going for the Oscar with Seven Psychopaths 2: 49 Psychopaths. The photo of the replica statuettes is by Antoine Taveneaux and licensed for reuse under this Creative Commons License.